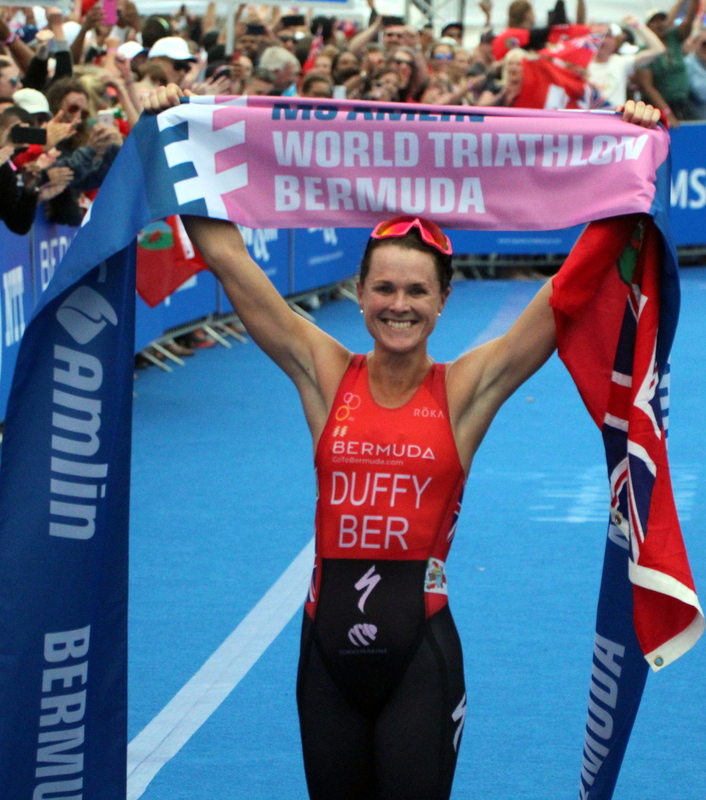 Flora Duffy could not have asked for a better race scenario as a sheer dominating performance captured her the 2018 MS Amlin World Triathlon Bermuda crown in front of thousands of cheering fans. The gold earned on home soil was her first World Triathlon Series win of the season and first for the inaugural event as she won with a marginal victory of 96 seconds in the first Olympic-Distance race of the season. Second place then went to Great Britain’s Vicky Holland after she won in a photo-finish sprint on the line with USA’s Katie Zaferes who then took the bronze. “I don’t think this moment is going to sink in for a while, but what I will say when it does is that this will probably be one of the highlights of my career. I mean this is incredible, the streets were lined, and it was just a phenomenal atmosphere, it was incredible. It was hard for me to control my emotions throughout that whole 10km, but with like 9.5km to go I just thought I need to smile and celebrate and soak this in,” Duffy said of her hometown-hero win. Collecting the leading position in the swim, bike and run, Duffy’s win also meant she became the first woman in WTS history to win a race after being the leader in all three disciplines, which included a 40-kilometre solo bike ride. “That wasn’t my plan, I wanted to get a small breakaway, that is why I pushed in the swim. Going up corkscrew I wasn’t really sure where everybody was, I knew Kirsten (Kasper) was there, I attacked it because that was my plan and I thought she would come with me, but she didn’t. So I thought, well I guess I am going 40km solo,” she added. Meanwhile, it was an overall historical day on the island as the debut 2018 MS Amlin World Triathlon Bermuda saw the nation of Norway sweep the men’s podium for the first-time in WTS history. In only his third World Triathlon Series elite race of his career, Casper Stornes dominated his way to claim Gold, while compatriots Kristian Blummenfelt and Gustav Iden finished off the Silver and Bronze to complete the sweep.